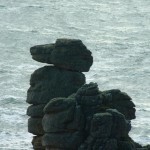 The CAMEL`S HEAD is located at Trewavas Head. 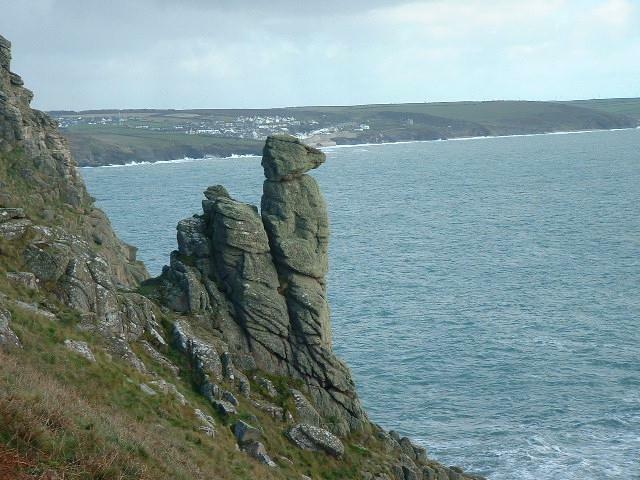 The CAMEL`S HEAD with Porthleven visible in the background. 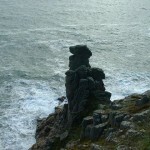 The rocks around Rinsey Cove and Trewavas Head form part of the metamorphic aureole that surrounds the Godolphin granite mass. This granite mass was one of several, from Dartmoor to the Isles of Scilly, that were intruded over a period of about 30 million years, between 270 · 300 million years ago into the sedimentary rocks that were being laid down on the ocean floor that covered present day Cornwall. The sedimentary rocks were altered (metamorphosed) by the intense heat and pressure caused by the intrusion of the molten granite. Much of the Rinsey area formed the roof of the granite mass and as a result the Rinsey area is a real mixture of metamorphosed rocks and intrusions of igneous rocks from the molten granite · granite sills (thick, mainly horizontal, intrusions of granite), aplites and pegmatites (these terms refer to their texture rather than their composition, aplites are fine grained meaning that they have cooled quickly, whereas pegmatites are a coarse crystalline igneous rock with crystals at least 1 cm long, most pegmatites contain quartz, potassium feldspar and sodium rich plagioclase feldspar and formed during the fluid and vapour phases after most of the granite had crystallised. Some complex pegmatites contain up to 300 different minerals (including tin and tourmalines), as well as spotted slates with andalusite and cordierite in them. 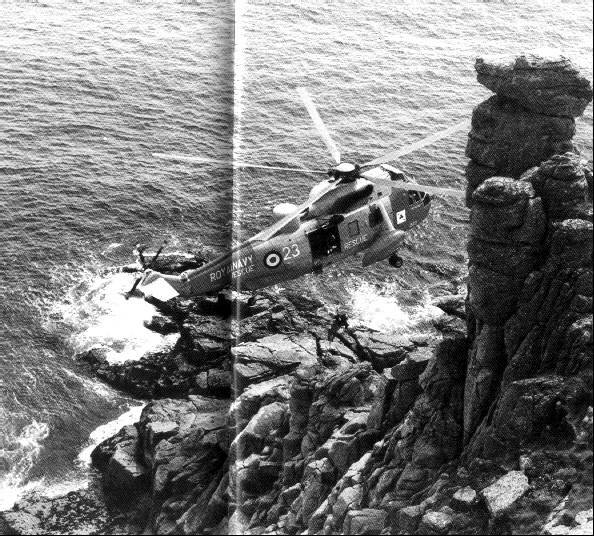 Seaking SAR5 helicopter from 771 NAS, RNAS Culdrose carrying out winching practice to the rocks below the Camels Head.